Fish hide among delicate corals and sponges down in the deep of the north-east Atlantic Ocean. Look close, and you can see urchins, anemones, and myriads of other creatures living among them. That these pictures are among the first to be taken of the life colonising the seamounts in the Marine Protected Areas, some 300km or so west of Scotland, frames their scientific significance. But what makes this even more remarkable is the story behind the camera – how a Plymouth University photography graduate, working with a renowned marine biologist, designed and built a new system that could revolutionise working in the deep sea forever. When Marcus Shirley graduated from his photography degree at Plymouth in 2009, he knew exactly what he was going to do next. Having originally rejected the chance to study engineering at Warwick, Marcus was keen to revisit his love of electronics and combine it with the photography skills he’d learned on his course. “My brother taught me to solder at the age of nine, and by 14 I was flying gliders,” he says. “It seems natural in hindsight that I’d become interested in aerial photography, and while I was studying for my degree, I built a kite camera and was designing radio control systems. In an age before drones, Marcus worked with gas turbine-powered, radio-controlled mini helicopters, and spent much of his time in the company’s workshop. He was also asked to help out at a sister company that built electronic control systems for yacht manufacturers, and it was during this time that the idea of working in the marine sector began to take root. In 2010, Marcus saw an advert for a taster day on remotely operated vehicles (ROVs) to be held at the Underwater Centre in Fort William, Scotland. He jumped on his motorbike, rode for an entire day, and took the course. When he returned to Plymouth, he searched the internet for local ROV companies, and found one, Hydrabotix, just 300 yards away from his house. He contacted the owner, and three weeks later he was working in the Caspian Sea. Dr Kerry Howell, Associate Professor in Marine Ecology, in the Faculty of Science and Engineering, has been investigating deep-sea environments in British territorial waters for more than 15 years. Her expertise in mapping and surveying, and finding hitherto undiscovered expanses of cold water coral, has played a crucial role in providing evidence to government bodies such as the Joint Nature Conservation Committee (JNCC). How does the DS2 work? Unlike more expensive autonomous and manually operated robots, or those cameras that rely on fragile fibre-optic cables, the DS2 plugs into a research vessel’s copper CTD cable and can then be lowered to depths of up to 3,000m. It has various sensors on board, including a CTD and altimeter. The vehicle is ‘flown’ by an operator at the surface controlling the cable winch so that it doesn’t strike the seabed. The camera records high-definition video, which is saved onto its solid state hard drive. It also feeds a standard-definition video signal back up the cable that can be viewed in real time, and once it breaks the surface, it can wirelessly send the HD video footage and sensor data to the operator. Kerry met Marcus in 2011 through the Marine Institute after he did some filming on shipwrecks, using the University’s ROV, for a programme on Channel 5. By now, he had set up his own company, Mr ROV. With some funding provided by the institute, she asked if he might be able to build her an underwater camera that could assist her in her research. This he did, using a GoPro camera, a secondhand titanium housing, some control electronics, and an extra-large battery. A better low-light sensor immediately improved the design, but then Kerry set Marcus a new challenge: could he build a system that would enable a scientist to view the pictures in real time at the surface? Oh, and do it on a budget of just £8,000? His solution was ingenious. The duo took the equipment to Belgium and hooked it up to a 2,000m cable on dry land, and it worked. 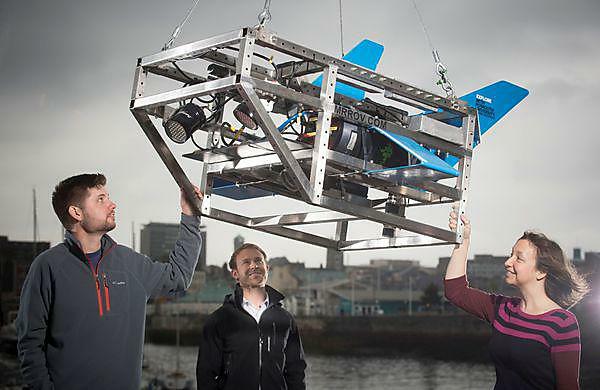 Within four months – now, mid 2014 –Marcus had created a prototype of Deep Search 1, which he and Kerry took out on the Belgica research vessel to the Southwest Canyons, a Marine Protected Area off the UK. Again, it worked, and the DS1 secured some good imagery from depths of up to 600m. It was enough for Kerry to write a Grant Capital Equipment bid to the Natural Environment Research Council (NERC), which was duly granted. With funding of nearly £80,000 from NERC, Marcus replaced the camera in the DS1 with an HD CCTV camera with controllable shutter speed, ethernet capabilities, a solid state hard drive and, critically, a new system allowing a digital (rather than analogue) video signal to be sent up a much longer CTD cable. In May 2015, they tested it again on board the Belgica, and Marcus made a final round of tweaks following that, installing new lights and better quality lasers that would enable Kerry to more accurately measure the size of the animals captured on film. The DS2 was ready. With support from the Marine Innovation Centre, part of the University’s GAIN network, the commercial potentials of the camera are now being explored alongside its own exploratory adventures. One of those came in May, when Kerry and Marcus went out on the NERC-funded RRS James Cook to look at seamounts off the west coast of Scotland, as part of the Deep Links project that Kerry leads with the University of Oxford, the JNCC, and the British Geological Survey. Much of the work there was conducted with cutting-edge autonomous robots, but they also tested DS2, and despite some technical and logistical limitations imposed by the vessel itself, they were able to obtain excellent imagery at depths of 500m. “It’s the closest thing we have to going into space,” says Kerry of the challenge of mapping the deep. “In fact, it’s harder to do and we know even less about what’s down there. But thanks to technology like DS2, we now have a cost-effective means to map these undiscovered environments so that we can better manage and protect them. Marcus recently provided a guest lecture to current Plymouth photography students, trying to sum up the remarkable twists and turns of his career to-date: one that has taken him around the world and back, to altitude and the depths of the ocean, and through a number of high-profile institutions such as Sea Life, San Diego State University and the National Marine Aquarium. Our purpose-built environment will enable you to develop a unique and personal visual language via observational or constructed photographic practice.